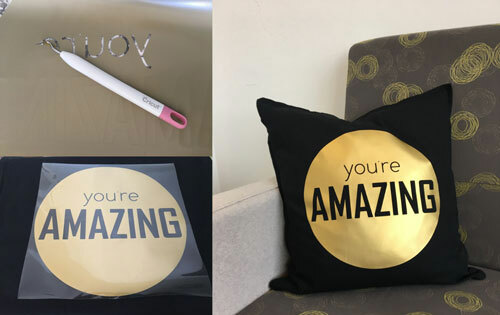 Whether it’s a cute phrase for a t-shirt, a motivational sign for your office wall or a funny saying for dad’s coffee mug, phrase projects seem to be high on everyone’s list. Design Space has countless (well, I’m sure we could count them, but we haven’t) phrases in the Image Library, but sometimes the task of finding one can seem a little daunting. I’m here to show you the ropes! Let’s navigate Design Space together and find some really great phrases to use on your next project. I’m going to give you 3 easy ways to look for some great images, and then how you can use them when you’re making something. Just one click to the filter and you can start to narrow down the choices. After I hit the filter in the top right and click the Phrases box, I scrolled down until I found these cute phrases. The range of styles is endless, from classic looks to the trendy hand-lettering. And in less than an hour, I had cut, weeded, and ironed on all these phrases. The weeding was the longest part of the making process for these projects. Fast gifts are always fun. Now, I’m ready for baby showers, birthdays, mother’s day, housewarmings, and just about anything! And I selected one, cut it out, weeded it, and ironed it on. Voila! You can also just go into Insert Image and search for “phrases” too. You never know what will appear that might inspire your next great project! I love how inspiring creative people can be. 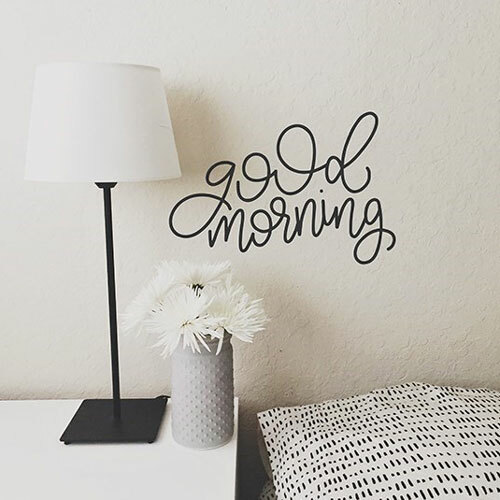 Show me some of your favorite font & phrase projects below or share them on Instagram using #SayItWithCricut - we're always re-sharing our favorite phrase projects! Let’s learn again together soon. When I attempted to do as you did above, I clicked my filter and checked phrases, but only three phrases appeared. And they weren’t even exactly phrases, they were just words such as “Welcome”. Please advise. 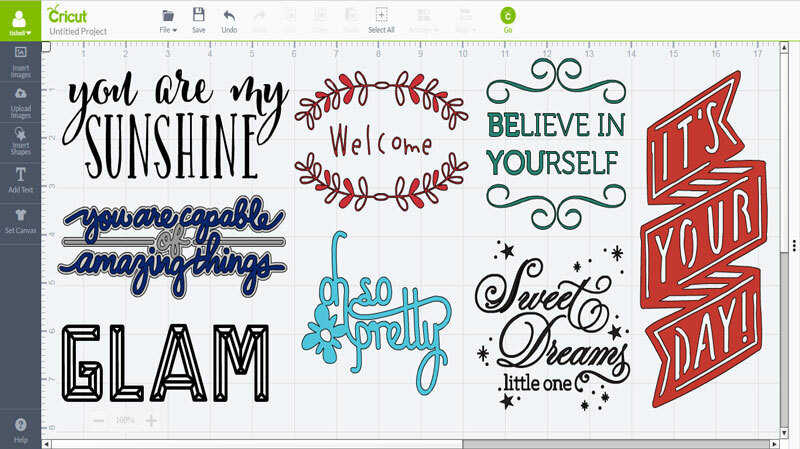 I am brand new and love my new cricut and love your emails. It teaches me a lot. But sometimes get frustrated as in this particular one. Can’t figure out how to get all these nice fancy phrases. Make sure that you are signed in. I love the community spirit here and how everyone is jumping in to help out! Debbie – hope this helped you. Let us know if you have any other questions or want to hear about a specific topic in an upcoming post! I have been looking for good phrases for a long time, but I must have been looking in the wrong place (on cartridges). Thanks for this information. YAY! I’m so glad this helped you. Cartridges are a great source of content too, but we’ve been releasing more and more digital content lately so my best experiences are in the images section since it’s all-encompassing! Thanks, Kal! Stay with us and we’ll be giving you even more insights! Suggest away if there’s something you are interested in hearing about from us too! Thanks for this information & inspiration! I am wanting to make stencils, but not needing to add the middle of letters by gluing them to my project. Is there a font that is made just for these projects. Like for the letter O, I don’t want to glue the middle circle down for each O I want to stencil, or the letter e, the little half circle, or the letter d, I don’t want to keep gluing the center piece in. Do you have a font available and if so, what is the best one to use. Thank you so much! I am trying to put an entire paragraph on something and I find that it’s really hard. I guess I’m not doing something right. Can someone help me? Thanks. I, to have purchased a Cricut and am new at this. I’ve had mine for 6 months or longer. It is one of the hardest machines to figure out. I’m so thankful I came across your post. It has helped me a lot. A special thank you to you. What vinyl should I be putting on cups or mugs that won’t come off if washed? Does any of it work on cups that Will be microwaved? I have a question, am I able to cut letters, words, etc vertical?? If so, please tell me how. Thanks! Right-click on the text and choose Ungroup. You can then move each of the letters to be vertically aligned. Once you have them placed, click at the top left corner and hold as you highlight all of the letters, then choose Weld. This will keep them together when cutting. If I know a specific image From a page in the booklet that goes with my cartridge, what do I type to find it? 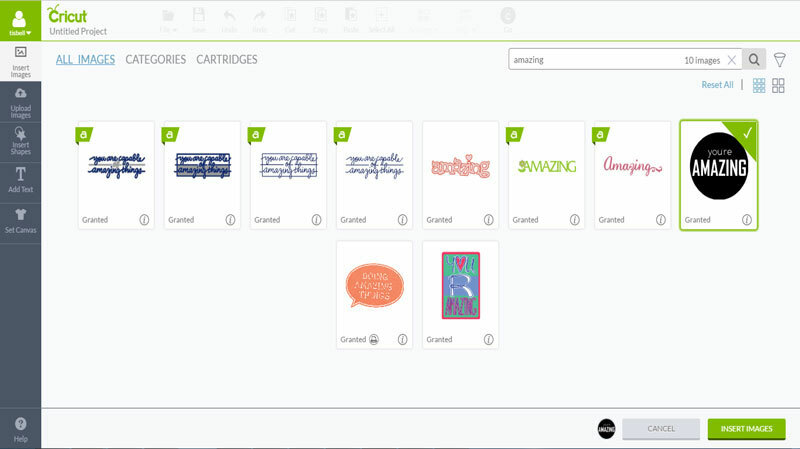 You can search for the cartridge under images, then choose the one that you are looking for.